MAD Distribution (Int) Ltd takes the privacy of its customers very seriously. We understand that you want to know how information about you is used, stored, and shared. And we understand the importance of protecting your personal information. Nobody wants to have their personal information sold or misused and we will never sell your personal information to anyone. Please take a moment to familiarise yourself with our privacy practices and let us know if you have any questions. We collect information to deliver the products and services you request and to help improve your website experience with MAD Distribution. Some information that we collect from you can be used to identify you or can be reasonably used in connection with other information to identify you. This information is called “personal information” and includes your name, postal address, email address, phone number, and payment information. You share personal information with us when you make an online purchase with us, when you create an account on one of our websites, when you visit or post a comment on one of our social media pages, and when you contact us or request customer service. MAD Distribution uses the personal information that we collect about you or that you provide to us: to process and dispatch your online orders; to keep you up to date with the status of your order; for marketing or advertising purposes; to inform you about promotional offers; to maintain your user account; to keep track of your order history; to respond to customer support enquiries; to present our Website and its contents to you; to tell you about changes to our Website; to let you know about products or services; to allow you to participate in interactive features on our website in a way that we describe to you at the time that you provide MAD Distribution your personal information; to fulfil any other purpose for which you provide it. The non-personal information that we collect may automatically be combined with other information that you provide and may be aggregated and used for statistical purposes. It helps us to improve our website and to deliver better and more personalised products, services and advertisements. It also helps us to estimate how many people may be interested in certain products, store your user preferences allowing us to customise the Website to your individual interests, recognise you when you revisit our website, and speed up your online experience with MAD Distribution. We may use the services of third parties to collect and use anonymous information about your visits and interactions with our Website through the use of technologies such as cookies to personalise advertisements for goods and services. At any time, you can review and change your personal information by logging into the website and visiting your account profile page. Here, you can make changes to your name, password, postal address, email address, or phone number that you had previously entered. We have implemented measures designed to secure your personal information from accidental loss and from unauthorised access, use, alteration and disclosure. 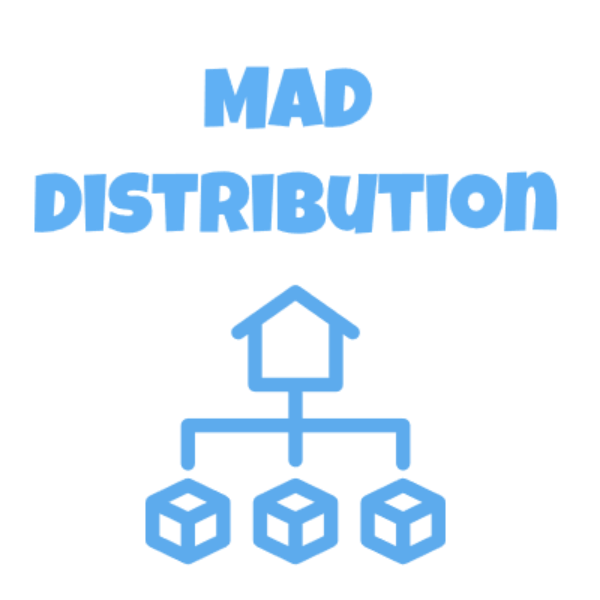 MAD Distribution stores and processes your personal information on its computers and servers in the United Kingdom. We protect your personal information by maintaining physical, electronic, and procedural safeguards in compliance with applicable UK and EU regulations. All personal information that you may provide on any of Websites will be Secure Socket Layer (SSL) encrypted. MAD Distribution also uses computer safeguards such as firewalls and data encryption methods to protect your information. The safety and security of your information also depends on you. For instance, you can start by using a complex and well-chosen password. You should avoid sharing your password or using any information that others can easily learn about you, such as a family member’s name or birthday. We also recommend that you frequently change your password. You can also install and regularly update antivirus and firewall software to protect your computer or device from external attacks by malicious users. When you are finished with a session on our website, be sure that you log out and close the browser window so nobody can pick up where you left off. Unfortunately, no method of transmission over the Internet, or method of electronic storage, is 100% secure. Therefore, we cannot guarantee the absolute security of your information. Any transmission of personal information is at your own risk and MAD Distribution is not responsible for the circumvention of any privacy settings or security measures contained on the website. Cookies are small data files that most websites store, access and maintain on the hard drive of your computer. We may use technologies, such as our own cookies, to provide you with personalised online advertising tailored to your interests (i.e. personalised display ads, social media ads, email marketing and PPC ads). Certain features of our website may use local stored objects (Flash cookies) to collect and store information about your preferences and navigation to, from and on our Website. These data files may be created on your computer when you visit our website. Flash cookies are most often used to personalise ads (i.e. on social media) or to enhance your experience on our website (i.e. to personalise the content you see on our website). Flash cookies will not access or remember your e-mail address or other personal information unless you willingly provide such information. Our website may also contain small electronic files known as web beacons (also referred to as clear gifs, pixel tags and single-pixel gifs) that permit MAD Distribution, for example, to count users who have visited particular webpages or and can be used for other related website statistics, such as verifying our system and server integrity. We use Facebook, Twitter and Pinterest tracking pixels to collect browser data, which we use to send personalised Facebook, Instagram, Twitter and Pinterest ads to users who have recently visited our website. When you sign up for our email newsletter, your email address may be uploaded to Facebook, Instagram, Twitter and Pinterest so that we can send you personalised social media ads. We may use your personal information to contact you with email newsletters that may be of interest to you. You may opt out of receiving any, or all, of these communications from us by following the unsubscribe link in any of our emails. This Website is not marketed to, and does not knowingly collect or maintain personal information from, children under the age of 16. If we learn that we have collected or received personal information from a child under the age of 16 without verification of parental consent, we will delete that information. If you believe we might have any information from or about a child under the age of 16, please let us know email. If MAD Distribution is involved in a merger, acquisition, asset sale, bankruptcy or reorganisation, your personal information may be shared, as well as retained by us. By providing us with your personal information, you consent to that transfer. If you wish to opt-out of receiving online communications from MAD Distribution, our partners, or our third party providers, you can choose the unsubscribe or opt-out link contained in the email and you will no longer receive communications.